After a week of being really slack with my meal planning I decided to start the week off right and prep a few of my favourite meals to have on hand during the following week. The first meal I decided to make was a Chicken Laksa by Annabel Langbein. This meal serves about 6 so Trent and I have it for lunch and dinner for two days - it's so fresh and delicious and I haven't go sick of it yet! Place rice sticks in a heatproof bowl and pour over boiling water to cover, stirring to fully submerge. Leave on the bench to soak while you make the laksa sauce and salad garnish. To make the sauce, heat the oil in a large pot and sizzle ginger, garlic, lime zest and curry paste for a minute. Add stock, coconut cream, sugar, fish sauce, optional chillies and tomatoes. Simmer for 5 minutes, then add sliced chicken, reduce the heat to a low simmer and cook gently for another 3-5 minutes until chicken is cooked through. Just before serving mix in the spinach and season to taste. Prepare the salad garnish and arrange on a platter. Drain noodles and divide them between serving bowls. 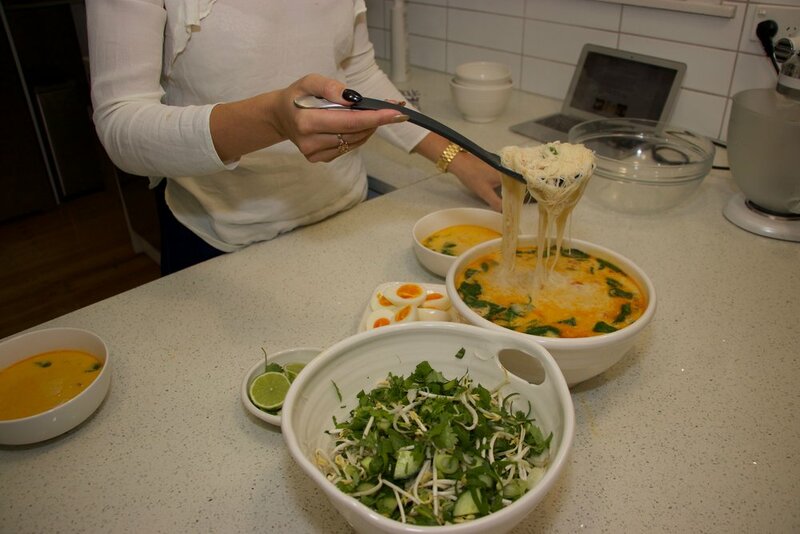 Arrange two egg halves on top of each and spoon over the laksa. Serve with the platter of salad garnish so everyone can help themselves.